Extracurricular programs can make many valuable contributions to the entire St. Mary educational process. Many of the lessons learned and habits acquired will benefit student athletes for years to come. In order for these contributions to be present, only qualified students can be involved in athletics and extra-curricular activities. Guidelines have been established to determine the students deserving to represent St. Mary Catholic School. All athletic participants must follow and meet the guidelines set by the CSAL. This includes all students participating in a sport with Newton USD 373. These guidelines will be closely monitored and are found in the handbook pgs. 6-10. St. Mary Catholic School is a KSHSAA member and abides by the rules governed by this organization. St. Mary teams include volleyball, basketball, track and field, and cheerleading. In 2012-13, St. Mary will have a middle school soccer team. St. Mary students participate with USD 373 through a cooperative agreement in the sports of cross country, football, wrestling, and tennis as well as any sports in which St. Mary cannot field a team. St. Mary also competes through the CSAL in Scholar Bowl, Religion Bowl, Battle of the Books and the diocesan Spelling Bee. Additionally, St. Mary is a member of the Valley Nine and competes in the Quiz Bowl, Music Contest, Spelling Bee and Art Fair. Both 7th and 8th grade teams finished 4th place in the 1st Diocesan Scholar Bowl meet. 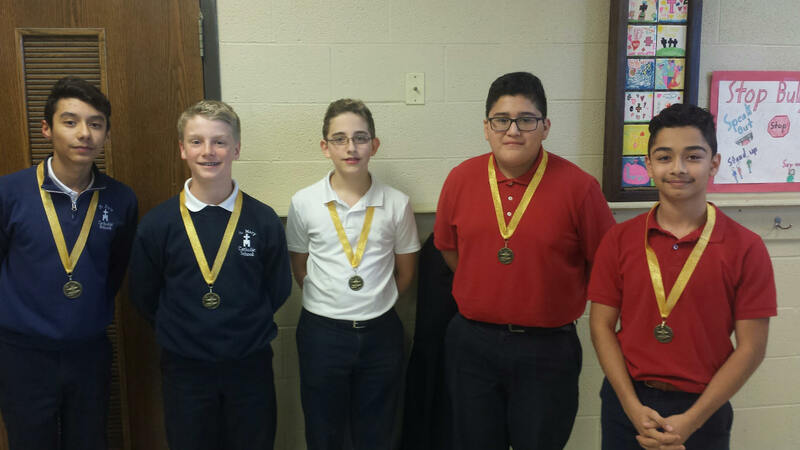 St. Mary Catholic School competed in the annual religion bowl competition held at Holy Cross Catholic School in Hutchinson. Our team finished with medals, placing 3rd in the competition. Pictured are students Ryan, John, Itzel, Charli and Ava. Thank you to Mrs. Breckunitch, Mrs. Silvernale-Wagner and the parent volunteers for helping our teams!